Editorials from Theslowlane: Traffic: Why they can't "build their way out of congestion." Traffic: Why they can't "build their way out of congestion." Folks advocating alternative transportation often say, "you can't build your way out of congestion." Meaning if a city tries to ease traffic by building more highways or adding lanes to existing highways, it wouldn't work. It will just bring more cars in short order as people move farther from jobs and so forth. Well, maybe this argument didn't apply back in the 1950s when the interstate highway system was first built. A big difference between then and now is the tremendous rise in property values. Maybe you could have built your way out of congestion when houses sold for around $20,000. Now it doesn't work anymore in this world of single family homes approaching 1 million dollars. Because it costs so much to buy the land to build the new road, or lanes. Gas tax no longer covers it. Even if the land is condemned "imminent domain" they still have to pay fair market value. Property values have shot up in the past few years compared to other things in the economy such as the gas tax. So, especially with property values where they are now, you can not build your way out of congestion. Ride the bus. Looks like someone's riding that house down the street. Do they want to put a road through your house? Here's a house going through the road. 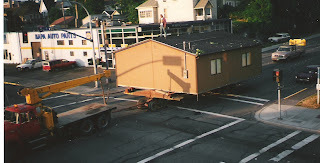 I saw this house moving several years back.